COLUMBIA COUNTY/LAKE CITY, FL – On Wednesday afternoon, Lake City's new city manager, Joe Helfenberger, along with Public Works Director Thomas Henry, and Community Redevelopment Advisory Committee (CRAC) member Gloria Spivey appeared before the Tourist Development Council (TDC) looking for money to fill a claimed $300,874 shortfall in the Waterfront Entertainment District, half of which it wanted from the TDC. The information provided to the TDC before the meeting did not include any financial statements, budgets, pro-forma accountings, business plan, or financial spread sheet regarding the Wilson Park/Lake DeSoto Waterfront Entertainment District finances. There was a letter. While some drawings of the band shell were included, the site plan did not reveal much of anything and was a preliminary plan/sketch. 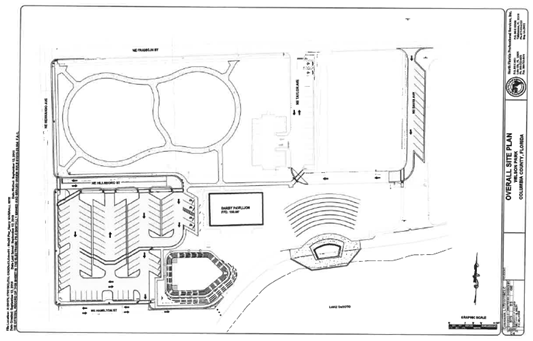 See: Amphitheater/Bandshell Coming to Downtown Lake City: Committee Gives Final Approval for pictures of the band shell. 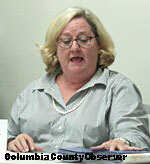 City Councilwoman Melinda Moses, a member of the TDC, contributed to the discussion. 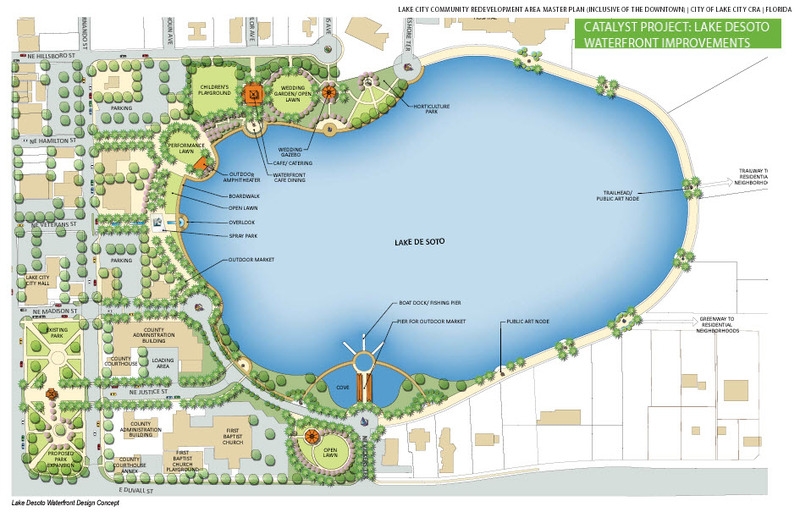 According to the 2011-12 Lake City Community Redevelopment Area Master Plan the Waterfront Entertainment District is composed of three "Key Community Assets:" Lake Desoto, wetlands, and Wilson Park. The Master Plan calls for the City to "undertake a detailed design master plan for the waterfront improvements." In December 2015, Lake City's Community Redevelopment Agency borrowed $1,185,000. It was discussed during CRAC meetings that this money was to go into the Waterfront Entertainment District. Five years later, there is still no "detailed design master plan for the waterfront improvements" for downtown Lake City. Instead, there are a bunch of helter-skelter plans which are the result of the backroom meetings between former City Manager Wendell Johnson, City Councilwoman Melinda Moses, and others. This past Wednesday, September 19, an array of City officials appeared at the TDC. Missing from the entourage was Assistant City Manager Grayson Cason, the person who authored the "asking for money" letter to the TDC. Mr. Cason provided no financial documents to support his claim of a $300,000 shortfall, nor the request for the TDC $150,000 contribution. 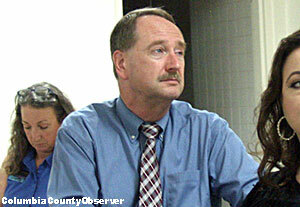 Mr. Cason's letter to County Commissioner Ronald Williams claimed that the City "just learned of our budget shortfall." It was obvious as the meeting progressed, despite the fumbling around of Councilwoman Moses and the rest of the City personnel, that the City's presentation was severely lacking. No one asked how after years of planning, the City "just" discovered the shortfall. County Chairperson and TDC member Tim Murphy introduced the topic: "Wilson Park Development Project. Funding Request. $150,000." Long time CRAC member, Gloria Spivey. Long time CRAC member Gloria Spivey made her explanations from the back corner of the room: "We came up a little short on our dollars and I believe we need about $300,000 to complete the amphitheater, which we feel is the prize jewel... We would just like some help in finishing it up." Commissioner Murphy asked, "What's the plan as far as raisin' the rest of the money?" Ms. Spivey responded, "We have some City clubs that have actually expressed interest in helping us complete this project; so with the $150k from you all. Then we will raise the additional 150 to get the 300,000 that is required to finish it." Public Works Director Thomas Henry added, "The lake should be the focal point of the downtown area." City Manager Helfenberger listening to Ms. Spivey. City Manager Helfenberger added, "If we are successful enough. If we get enough public and private and foundation assistance and other sources; if for some reason we are able to raise enough funds, we would like to see the band shell over on the water like it was originally planned, but with the funds we've got, this is what we're able to do." TDC member and hotel mogul Nick Patel asked, "Do you have a rendering of this? A bird's eye view?" The City folks fumbled around looking for something. 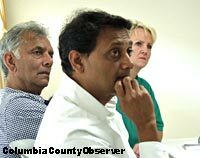 Hotel mogul Nick Patel (in front) listens to the the City presenters. Behind him is Mahendra Patel, owner of Lake City's Holiday Inn, and behind him is Stephanie Sanchez, Lake City RV resort manager. All are members of the TDC. Public Works Director Henry advised, "Our engineer, they don't have all that completed." Mr. Henry explained what the TDC has is what the City has, "but it's out to bid to do the construction part right now." That did not satisfy Mr. Patel: "I'm looking for a view of how this is all going to look." Councilwoman Moses fumbles through her stuff again and still couldn't find anything. Director Henry tells the Council, "The engineer is working on that. I'll ask him for it." Ms. Spivey adds, "It's going to have stone. It's going to look very nice." If the City had come prepared, it could have included this design concept from the City's master plan. Click here to enlarge. Mr. Patel wasn't being placated and asked again for a rendering, "Where it's going in the park area and all that stuff." Director Henry laid it on the engineer, North Florida Professional Services, "Our engineer doesn't have all that completed, but it's out to bid to do the construction part." Ms. Moses finds something else and asked if that is what Mr. Patel wanted. It wasn't. After TDC member Chris Candler asked how they were going to fill the proposed amphitheater (2,000 seats) City Manager Helfenberger announced, "We're looking at moving towards having a special events coordinator with the city... I think that person would really make that a reality." • Begin reading about Representative Liz Porter's FL TaxWatch Turkey, the Jack Berry Hwy, here. Mr. Henry explained if the Hospital Authority moves the helicopter pad it could donate the old property, which could be used for a physical fitness park and a trail, and "then we're talkin' about adding a golf park... There's more plans comin'. We're pretty far away from that phase at this time." This plan revolves around the Jack Berry Highway, which has gone sub-rosa in Lake City's crumbling City Hall. Nick Patel asked for a line item breakdown of the amphitheater. "You're asking us to help fund this," he said. 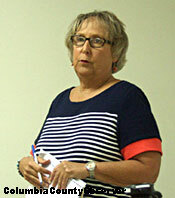 TDC Director Paula Vann answered, "I didn't get it in time for the packet. It is on the screen." The breakdown has been available for months. Commissioner Murphy asked if the amphitheater blocked the road. Dir. Henry responded, "We're backpedaling right now. We're trying to build the amphitheater over the water. So if we go over the water, the road will be open... If we have to build it on the road, it will be closed off for vehicles, but not foot traffic." Mr. Patel again asked about the funding. Dir. Henry explained the funding was just for the construction part. "That's why we're here to ask for the extra 150k." Commissioner Murphy asked, "Mr. Helfenberger, how much money is on hand to do the project now? Commissioner Murphy followed up, "Out of the $1.2 mil, the amphitheater is not included in that?" Commissioner Murphy asked for the cost of the amphitheater. Director Henry answered, "It came in at roughly $300,000." By this time, everybody was dizzy. Commissioner Murphy asked if anyone had any questions. There were none. Commissioner Murphy said, "I don't think none of us are in a position to make a move on this today. I think there's a lot of studyin' needs to be done." Ms. Moses fumbling for non-existent documents. Mr. Patel said, "I think it's a great idea. I need more details." City Councilwoman Moses opined, "Five years ago we wouldn't be havin' this conversation. Now, it's kind of a new day... This is somethin' we're all gonna' have to work together on. The addition to the amphitheater is the diamond in the ring." Mr. Patel had the last word, "There is a lot of education that needs to be done to make us feel more comfortable."